Halloween is my favorite holiday of the year! With all the candy and decorations – what’s not to love? I decorate the entire house with whimsical and cute decorations like this Pumpkin Patch – no scary stuff here! So when I decided my kitchen table needed a new Halloween centerpiece this year, I naturally turned to Smoothfoam. 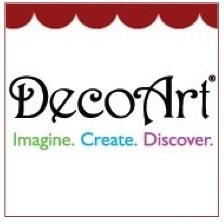 It’s incredibly versatile – easy to paint and decoupage! Adhesive TIPs: For best results, use gel medium to adhere large pieces of paper to other papers or to Smoothfoam. Use Tacky Glue for adhering smaller pieces (paper, wood, Smoothfoam, etc.) together that need a strong bond. Use a tape runner for smaller paper-to-paper applications. 1. 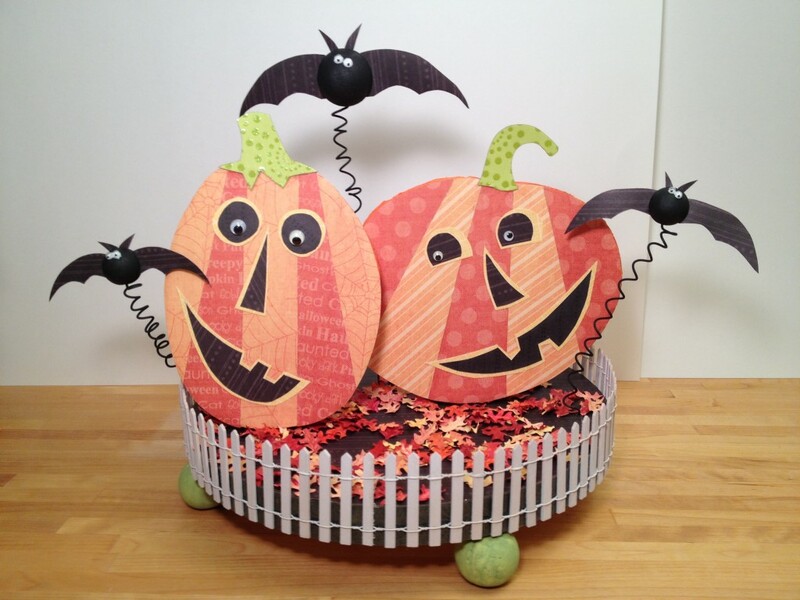 Draw two 6″ oval (tall pumpkin shape) side by side on the 12″ Smoothfoam sheet. Cut them out with a serrated knife and smooth the edges by gently rubbing the Smoothfoam pieces against each other. 2. Paint the edges of both ovals orange. Paint four of the 1-1/2″ Smoothfoam balls green. Paint the edge of the disc black. Paint the three remaining balls black. Allow all painted pieces to dry thoroughly. TIP: Open and straighten one end of a large paperclip and insert in the bottom of each Smoothfoam ball to paint, then hang from opposite end to let dry. 3. To make the pumpkin patch, trace the 12″ disc on to the back of a sheet of black paper, then cut out and adhere the paper to the disc. Glue the picket fence to the edge of the black disc and secure it with large rubber band until dry. 4. To make the pumpkins, trace each oval on light orange and a dark orange papers and cut out. Glue dark orange paper on one oval and light orange paper on the other. Cut wedges from the other orange ovals; glue to each pumpkin as shown. 5. 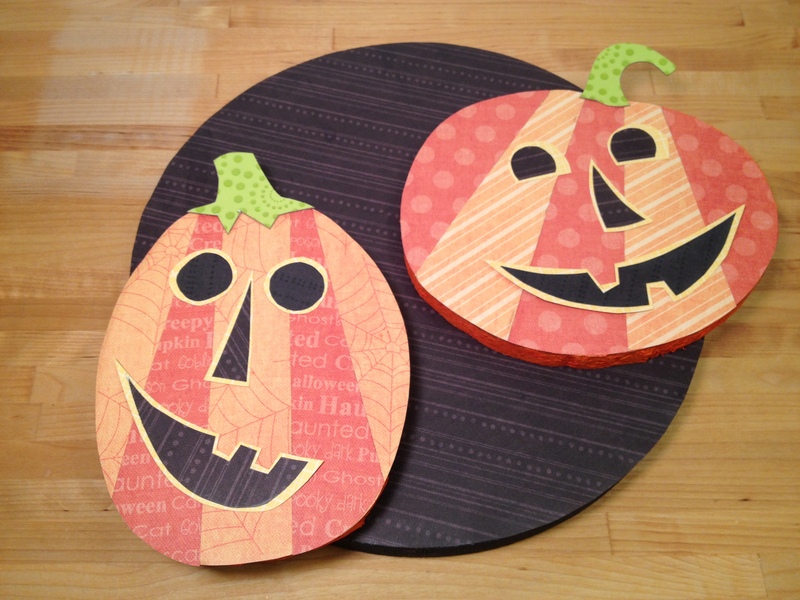 Draw two pumpkin stems on chipboard and glue to the back of the green paper. Cut out and glue stems to the pumpkin tops. Draw jack-o-lantern features on black paper, cut out and glue to yellow paper, then cut around the black, leaving a yellow margin. Glue the features and medium wiggle eyes to the pumpkins. Decorate the back of the pumpkins too! 6. Cut out 3 sets of bat wings and 3 sets of bat ears from black paper. 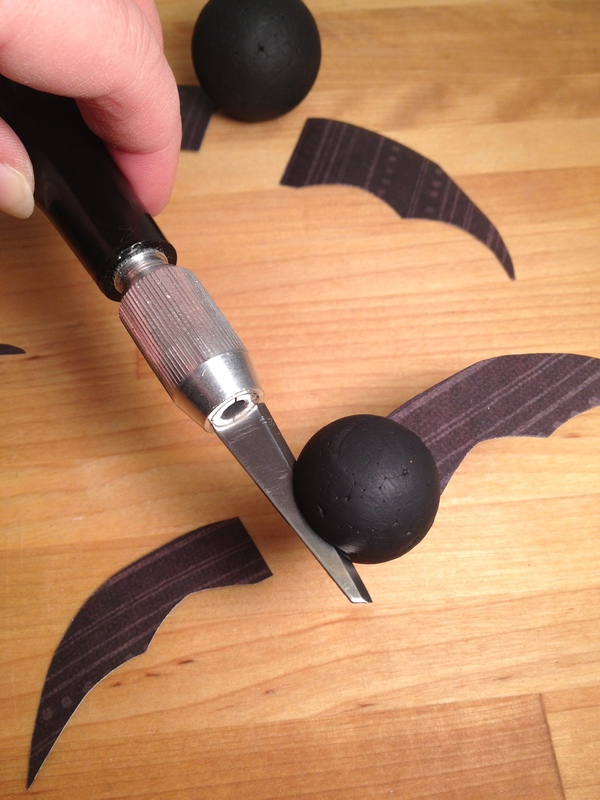 Cut slits at the top and sides of the black Smoothfoam balls to insert the wings and ears. Glue on small wiggle eyes. Curl each wire around a pencil then pull the curls to expand. Add glue to each wire tip and insert it into the bottom of each bat. 7. To add feet to this centerpiece, poke 1/2 a toothpick (with glue on each tip) into each green Smoothfoam ball, then poke each of the four balls into the bottom of the disc. Attach the pumpkins to the top of the disc the same way, using two full-size toothpicks for each. Add a little glue to the bottom of each bat wire and insert them into disc in whatever positions you like. Sprinkle mini autumn leaves on the disc to finish. Smooth move – has this happened to you? 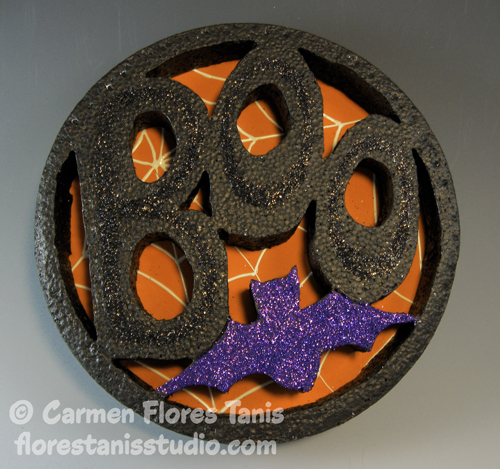 Why carve just pumpkins when you can carve Smoothfoam into a fun Halloween wallhanging too! 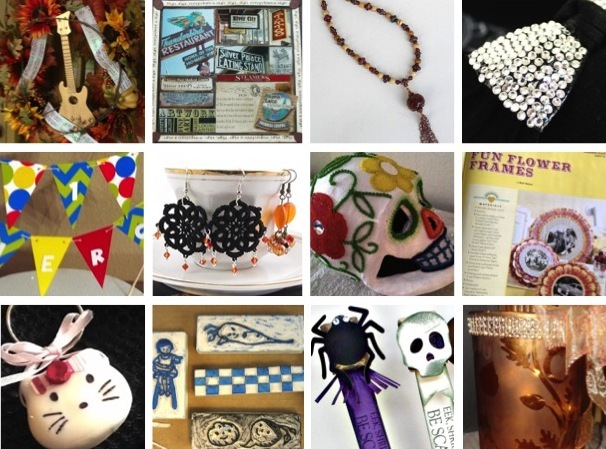 Halloween is such a fun holiday—I love to make Halloween crafts to enjoy throughout the entire month of October. 1. Draw or print from the computer the word “Boo” on paper to fit within the 9″ disc diameter, allowing at least a 1/2″ border. Add a bat shape to the drawing. Tape the drawing to the disc and insert carbon under the paper. Trace around the words with a pencil to transfer them to the disc, then remove the papers. 2. Carefully carve out the letters and bat with the hot-wire tool. 3. Paint the letters and bat black; let dry. 4. Brush glue on the bat shape and sprinkle purple glitter on top. Brush glue on the letters and sprinkle black glitter. 5. Cut a 6” circle from the foam core sheet. 6. Paint the foam core circle orange; let dry. Draw a spiderweb on top with white Scribbles paint; set aside to dry. 7. Glue the carved Smoothfoam to the orange circle. Touch up the sides with black paint as needed. 8. Glue a picture frame hook to the back of the circle for hanging. Happy Fall! I love this time of year, as you can tell. I wanted to bring you a cute, ghoulish treat to make for your Halloween décor. They do look good enough to eat…but make sure the kids leave them on your display! 1. 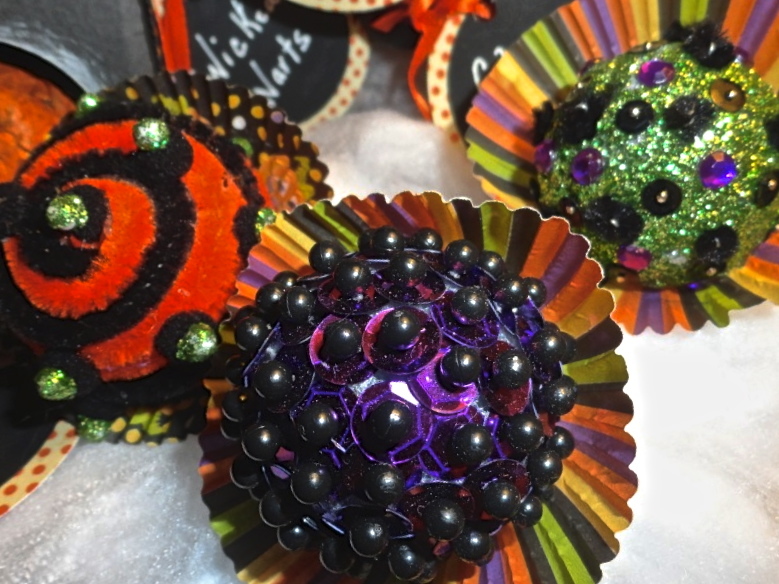 Cut each ball in half, paint each half with a thin coat of craft glue and sprinkle with different colors of glitter to cover; set aside to dry. 2. Add a sequin to a pin and poke it into the ball – try different patterns and colors of sequins as shown above. 3. As an alternative to glitter, glue coiled pipe cleaners around a ball half and accent with sequins or googly eyes. 4. To make your faux candy display more fun, add tags to each bonbon with “haunting flavors” like Wicked Warts, Eye Candy, Glittery Slime or Purple People Eater. I love mirrors—not so much for looking at myself—but because they add depth and dimension to a room. Try giving new life to an old mirror with Smoothfoam! I’ve had this little purple-rimmed mirror for a while. In my attempt to get some de-cluttering done, I almost sent this mirror to the thrift store, but I decided to hold on to it for a little longer. I’m so glad I did! 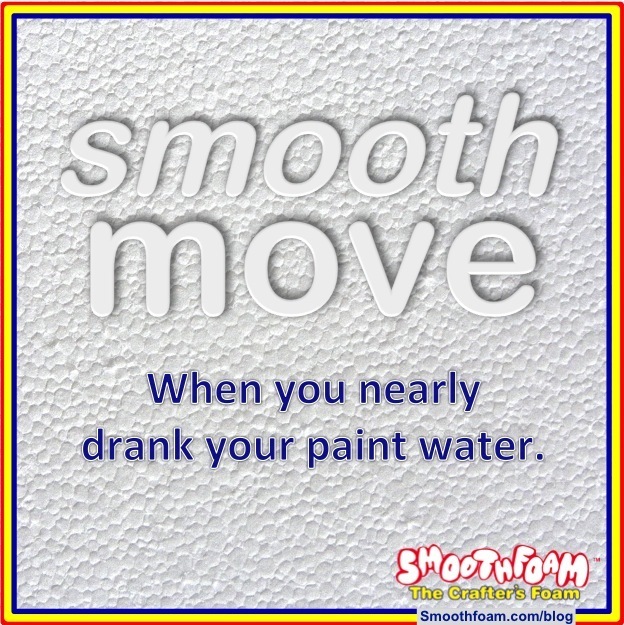 It was the perfect size to create new wall art with the help of SmoothFoam. I also love printed tissue paper and I have a good-sized stash of it. When I opened the box looking for crepe paper, which was my original choice for this ruffled edge, this patterned tissue jumped out at me – one of those “a-ha” moments. 1. Paint the Smoothfoam disc black; set aside to dry. 2. Cut the balls in half, then apply foiling glue and gold (or silver) leaf to each half. 3. 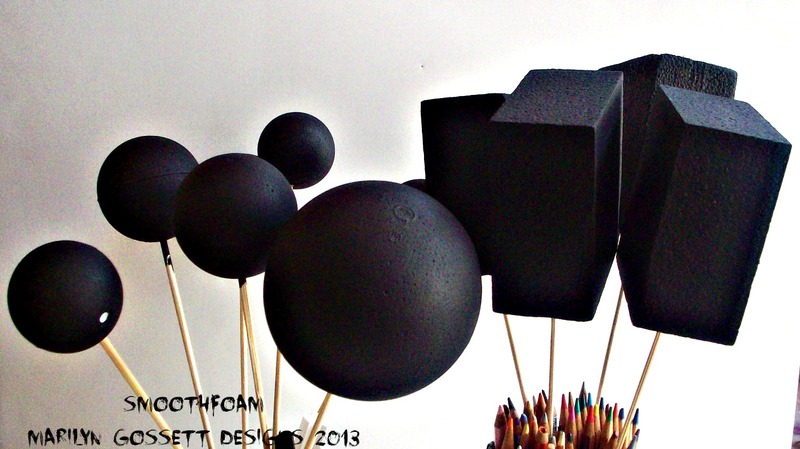 Add black dots with dimensional paint; set aside to dry. 4. 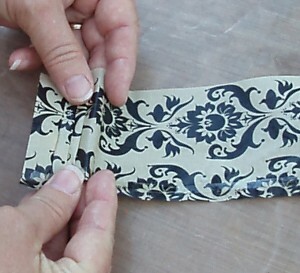 Apply a row of double-stick tape along one side of each strip of tissue and fold accordion-style, adhering each folded edge to the tape to hold the pleated ruffle. 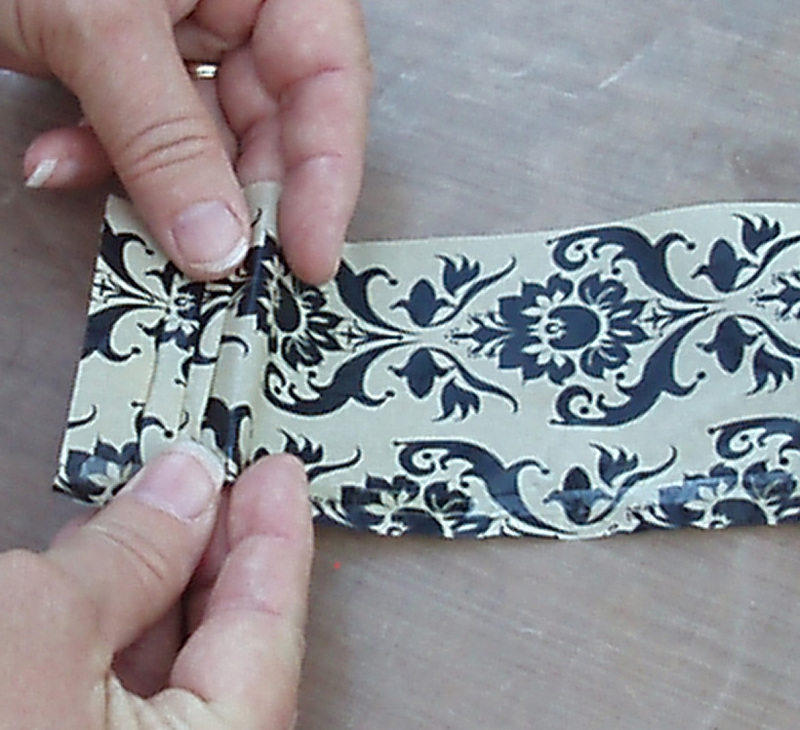 Make sure the pattern matches at the adjoining edges of each strip. 5. Center the mirror on the Smoothfoam disk and trace around the edge to make a guide for gluing the taped edge of the ruffles around the edge of the disk. 6. 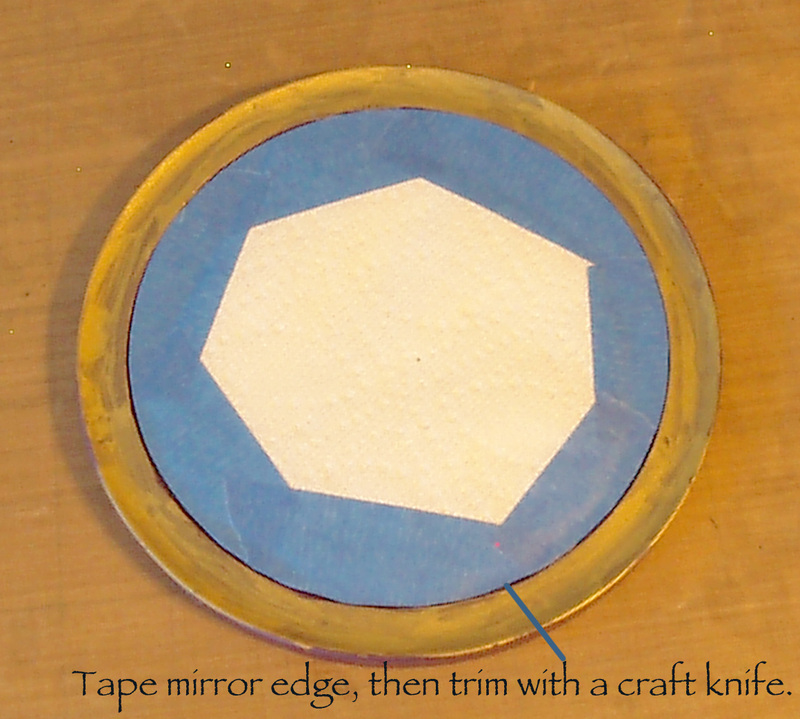 To mask off the mirror before painting the frame, cut a circle of scrap paper slightly smaller than the mirror. 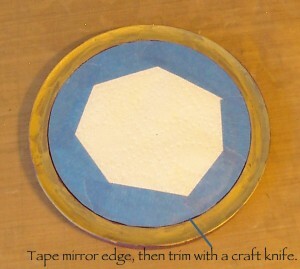 Tape the paper to the mirror, overlapping the edges, then trim away the excess painter’s tape around the mirror with a craft knife. 7. Apply embossing ink and embossing powder to the mirror frame, then blow a heat gun on it until powder melts. Apply a second coat if necessary. 8. 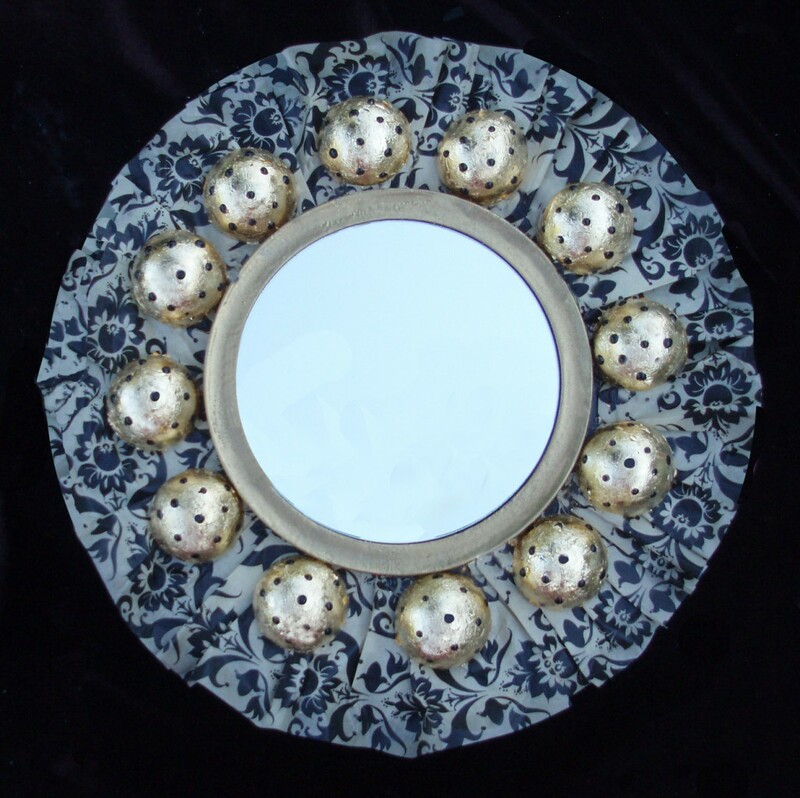 Adhere mirror to ruffled disk with Quick Grip adhesive. 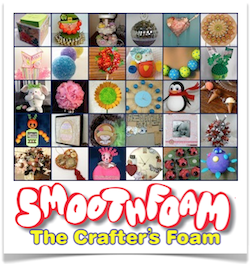 Add Smoothfoam ball halves with Tacky Glue. Adhere a hanging tab to back if the mirror does not already have one. I’ve been noticing a lot of faux zinc technique projects popping up on Pinterest and decided to give it a try on Smoothfoam! 1. Smooth the cut edges of the Smoothfoam base sheet with sandpaper as needed. 2. Paint the base sheet and all the letters black (front and back) and let dry. 3. 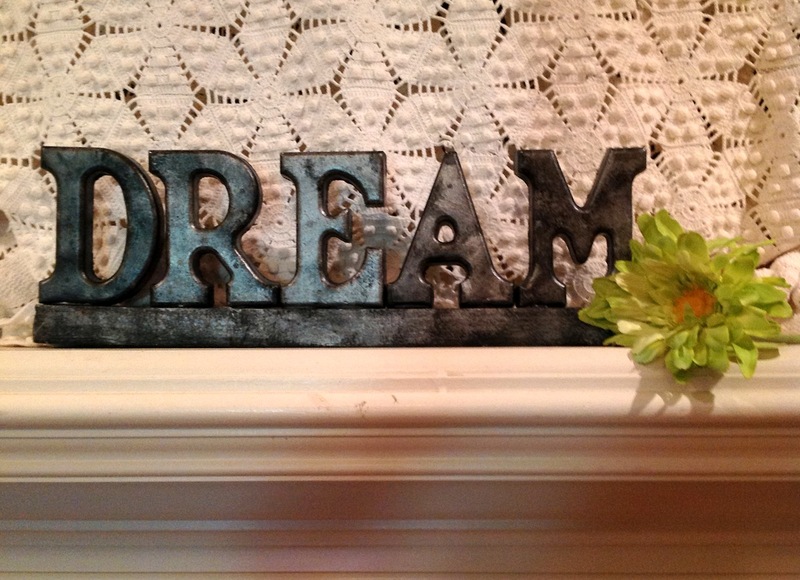 Dab small amounts of silver paint randomly over the black letters and base with the stipple brush and let dry. 4. Gently rub paste wax over all the surfaces with a soft cloth. 5. Glue each letter to the base. It’s almost October and Halloween décor is everywhere in the stores. Some of it’s pretty scary, especially the spiders, but my version of a Halloween spider decoration leans more towards cute and colorful. This explains my fuzzy spider wearing a glittery bow and eyelashes with purple legs…even spiders want to dress up for Halloween! 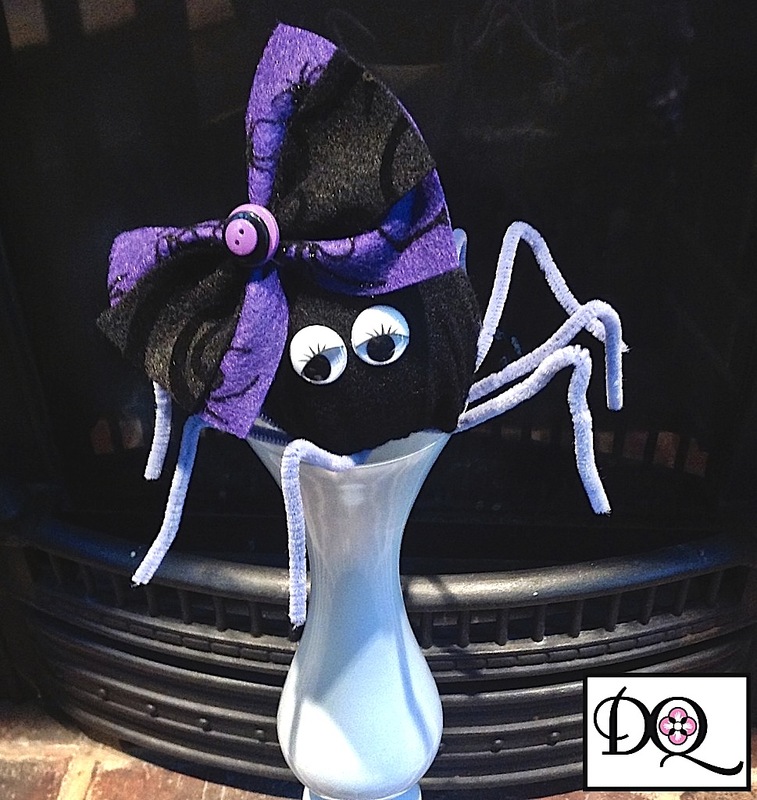 This cute spider is so quick and easy to make, you can create a whole group of them with different colored legs and bows. Use them for party favors for some of your favorite trick-or-treaters. 1. Cut an 8” circle and a 2” x 5” strip from the black felt. Cut a 3” by 5” piece from the purple felt. 2. Make a gathering stitch around the edge of the felt circle with embroidery floss and leave the needle threaded with several inches of floss at each end. Place the Smoothfoam ball in the center of the felt circle and pull the ends of the floss tight to wrap the felt snugly around the ball. Make a couple stitches through the gathered felt to hold it in place – this is the bottom of the spider. 3. Center 4 chenille stems together at the bottom of the spider. Make a few stitches back and forth across the stems to hold in place; tie off the floss and trim away the excess. 4. Turn the spider over and bend all the legs as shown. Glue the eyes in place. 5. Place the purple strip of felt on top of the black piece of felt to make the bow. Pinch the felt in the center and tie with some floss. Glue the bow to the spider, then stack and glue three buttons to the center of the bow. Bats, cats and spiders…oh my! Decorating for Halloween is a big deal in our house, second only to Christmas. These whimsical bats, cats and spiders are perfect for greeting guests or for gracing a mantel top. I hope you enjoy it! 1. Paint all the Smoothfoam pieces black (use skewers as handles) and place skewered pieces in a glass, can or vase to let dry. 2. To make the spider legs, poke 4 pilot holes down each side of the spider’s body with the tip of a skewer, using the seam on the ball as a guide. Push one end of each chenille stem into the 8 holes. Bend each leg at the knee and foot as shown. 3. Glue two chenille stems to the front center area of the 3-1/4″ ball for the cat’s whiskers. 4. For the bats and spider, connect the 2″ balls for the heads to the 2-1/4″ balls for the bodies with toothpicks, then connect each critter to the top of a block and secure with glue. 5. 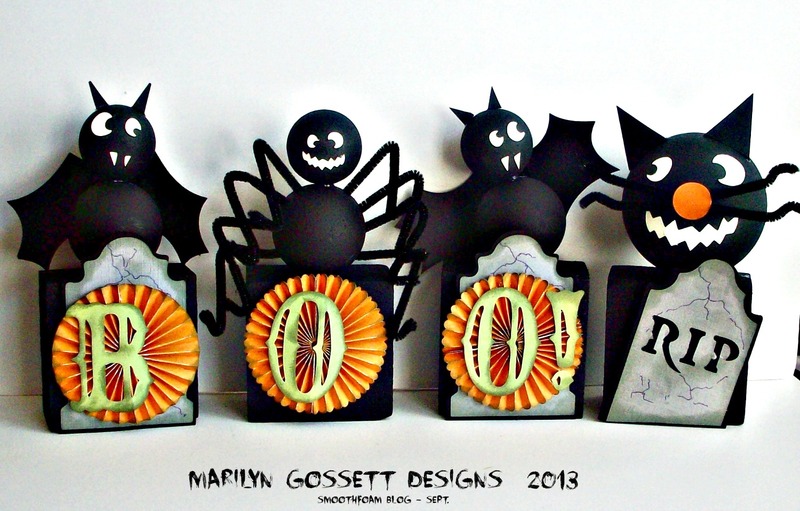 Cut out all the embellishments from the various colors of cardstock as shown – eyes, teeth, wings, ears, tombstones, lettering – and adhere to the critters. Use the marker to draw crack lines on each tombstone. 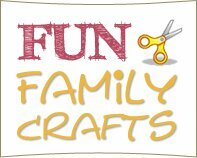 Use your favorite die-cuts or click here to download my hand-drawn shapes to cut out if you like.